Co-Fluampicil is a drug that belongs to the class of penicillin antibiotics. It contains two active ingredients: flucloxacillin and ampicillin. 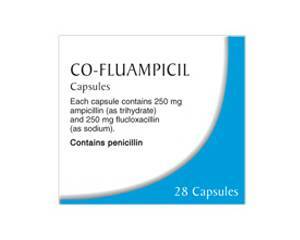 Co-Fluampicil is used for the treatment of bacterial infections. The medication stops the growth of bacteria, so the infection is combated. The antibiotic is commonly used for bacterial infections of which the type of bacteria is unknown, or to combat bacteria that produce penicillinase. This is an enzyme that is produced by certain bacteria, which makes them resistant to some antibiotics. The medication is prescribed for respiratory infections, ear - nose - and throat infections and skin infections. The two active substances; flucloxacillin and ampicillin attack the cell walls of the bacteria that causes the bacterial infection. The antibiotic penetrates inside and kills the bacteria. The action of Co-Fluampicil differs from other penicillin antibiotics, because the substance is resistant to the penicillinase enzyme that is produced by certain bacteria. This enzyme makes certain bacteria resistant to certain antibiotics. Co-Fluampicil is therefore very effective to combat this type of bacteria, because flucloxacilline retains its action. Always follow the instructions of your doctor when using Co-Fluampicil, and read the leaflet carefully. How much and at what time you need to take the drug depends on the severity of the condition. The usual dosage is 4 times a day, spread throughout the day. It is advisable to take the drug every six hours . Be sure to swallow the capsules on an empty stomach. This means that you need to take the medication one hour before eating or two hours after you have eaten. If you forget to take a dose, take the forgotten dose as soon as you remember. If it is almost time to take the next dose, you do not have to take the forgotten dose anymore. Do not take a double dose. Drinking lots of water and eating small amounts throughout the day may help to reduce side effects. If side effects last longer or if you are unsure, contact your doctor. Read the complete list of side effects in the Co-Fluampicil leaflet. You will also read in which cases you have to be careful with the medication or when you should not take it. You can order Co-Fluampicil online at Dokteronline.com, securely and discreetly with a doctor's prescription. Co-Fluampicil is available in 250/250 (flucloxacillin 250 mg, ampicillin 250 mg).